Are you looking for ways to track symptoms and live life easier with a chronic illness? 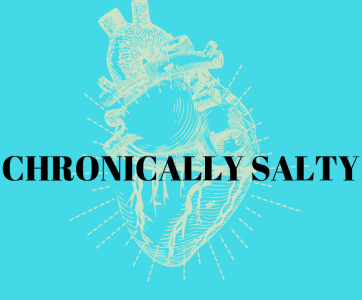 Good thing Chronically Salty’s got your back. When first diagnosed with a chronic illness, it can be difficult to manage so much information all the time, keep up with daily living activities, AND stay sane. I must have tried out dozens upon dozens of apps to see what would help best with my POTS (dysautonomia), food sensitivities, and anxiety. I also found that sometimes when in a massive flare, the only things I can guarantee will be with me are my phone and a bottle of water, so having a smartphone is a massive asset to my well-being. The App: Cardiogram is the go-to vital tracker for Apple Watch. It tracks steps, exercise, sleep, peak heart rate, and resting heart rate. Why I love it: With POTS, my heart rate fluctuates… a lot. And with that comes challenges in finding an appropriate heart rate tracker. I am still not very impressed with the Apple Watch, but I am impressed by Cardiogram’s ability to calculate my resting heart rate more accurately than Apple’s Health app. It also allows you to do continuous monitoring, which is a feature not available on the Health app. The App: Kardia is an app specifically made for AliveCor. AliveCor is the only FDA approved portable ECG monitor. They even recently came out with an Apple Watch wristband with a built-in ECG monitor! Why I love it: Even though Kardia was developed to help diagnose atrial fibrillation, I use Kardia to record ECG readings when I feel like I am in SVT, another heart arrhythmia. I can then send the readings back to my cardiologist as a PDF for them to review. The App: Flaredown is an app created specifically for people living with chronic illnesses. You can even connect with other people who are tracking similar illnesses or symptoms. Why I love it: I recently discovered Flaredown and have not been disappointed. You can easily edit medications/supplements you want to track, symptoms, and illnesses. It even will create a graph of trends! One aspect I really like is that it automatically can track the weather for you. Weather can flare up my POTS, so I am in love with that feature! Cost: $50-100/year plus shopper tip. Free delivery over $35. The App: Shipt is much like Instacart. You pay an annual fee and then as long as you spend over $35, the delivery is free. A tip is optional, but who doesn’t tip? They even deliver from Lidl, which is a major plus. There is a slight markup per item, but it isn’t much. Why I love it: My Shipt shoppers are always great and I have usually the same person for each store, so they know what I want in advance. It is extremely difficult to go to department and grocery stores when you are sensitive to the lights…and standing. It is also a great way to get healthy groceries every week without going out into the heat in the summer and during times you can’t drive. I once was in a major POTS hell-hole and my Shipt shopper spent an absurd amount of time finding me unflavored Pedialyte in the back of the store because I can’t do colors/dyes. What a champion! The App: Day One is a mobile journaling app. You can add pictures to your journal entries, have multiple journals going at the same time, and even have a copy of your journal printed like a book. There is also a great Facebook community associated with it to help you get your creative juices on! Why I love it: Day One is a great way to throw down my thoughts as quickly or in-depth as I want. I also struggle with a lot of brain fog, so sometimes I just upload a picture and caption and go back later to fill out the entry. Overall, definitely lot less hassle than my old, heavy, and leather-bound journal! The App: MyNetDiary is an app made for calorie counting and nutrition tracking. It is a pretty simple app, but it does its job well. Why I love it: A lot of calorie counting apps are made for weight loss, but what about weight gain? I never used to have to calorie count before having POTS and gastroparesis-like symptoms. You never feel like eating! But then your BMI is less than 18 and things begin to get dicey. It helps me keep track of the number of calories I need per day to gain my target pounds per month. The App: To all those menstruating-humans out there– this is the app for you! As much as we hate to admit, hormone cycles tend to make a huge impact on chronic illnesses. This app tracks your periods and PMS symptoms in a clear, easy to follow way. Why I love it: I struggle with estrogen dominance symptoms and irregular periods, so having an app dedicated to my cycle is helpful for me to determine what is my hormones making POTS worse and what is just POTS. You can even add in individualized notes for each day, which helps me track adrenaline dumps and heart rate spikes during the month. Turns out my resting heart rate is about 15 BPM higher during the last week of my cycle? This app has helped me modify my medications to prepare for that. The App: Calm is an app meant to soothe and relax your system through guided meditations, mindfulness-based exercises, and even calming sleep stories. It also has a great selection of ambient sounds. Why I love it: If you are faced with lots of stressors, and let’s face it, everyone is stressed these days, you are in need of some serious calming action. I use it to help kickstart my parasympathetic nervous system and get out of panic attack cycles. The App: A simple app that allows you to track medications easily. It also produces reports you can share with doctors on your compliance and can send you reminders to take your medication. Why I love it: I almost never forget my medications/supplements, but sometimes it is difficult for me to remember to take it at the same time every day. My Therapy helps set those reminders until it becomes a habit with each new medication/supplement. The App: This app is made to be used with your local library. It is a mobile platform for you to get loans on the latest ebooks and audiobooks. Why I love it: I love listening to audiobooks to help me with insomnia and to distract me when my heart is going bonkers. You can only take out 14-day loans, but it’s free! Know of any other good apps to try! Leave a comment– I would love to hear your recommendations! Next Post Corlanor (ivabradine) for POTS: Does it Really Work? Kardia sounds like a great app! I too have POTS and experience SVT at times.If only they could come up with a portable way to track blood pressure and O2 sat levels easily though without having to carry around a big machine. The first two apps require either the kardia device or a fitness tracker but all the other apps I just use the free versions! Thanks for the read!